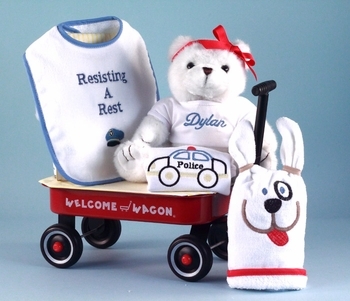 Welcome the special new cadet with this clever and cute gift wagon. Ideal for any law enforcement family, the set comes with police-themed layette items in a mini wooden wagon. There’s even a plush teddy bear that can be personalized with baby’s name if desired. Choose from a boy or girl's version. Click on More Images above to see the boy version without the ribbon on the bear. Comes fully gift wrapped! Note: the metal wagon in the picture has been replaced with a larger, all wood red wagon. Click on More Images above to see the new wooden wagon. My brother thought this was soooooo cute! Having the baby's name on it makes it even better.